We would like to thank all of the users who participated in our latest Verlympic Event! We would also like to congratulate the winners for this round for the Most Main Shop Items Bought! The Verlympic Event for this round is for the Most Main Shop Items Bought. To win this round, you will have to restock as many items in all of the Main Shops as you can before time for the event runs out. Good Luck! We would also like to congratulate the winners for this round for the Most Main Shop Items Bought - Verver! No one won the jackpot this week! 1 user matched 4 numbers and won 272,911 VP. A total of 1,910,379 VP was not won this week and will rollover into next weeks jackpot. The Verlympic Event for this round is for the Most Items Bought From Verver. To win this round, you will have to restock as many items in Verver as you can before time for the event runs out. Good Luck! This weeks sunday auctions have begun, if you're lucky you may find a few new items appearing. Sunday Auctions are all Mystery Auctions with some rare and awesome items up for grabs at bargain prices at the Auction House! We would like to thank rinzler for supporting the site with their purchase of a Custom Verbie Voucher and a Custom Item Voucher! You can now find the Sentient Television and Royal Izret Pillow stocking in the Custom Item Shop! Do you want your very own custom item on the site? Then head on down to the Cash Shop to purchase a Custom Item Voucher or a Custom Verbie Voucher! By purchasing one of these, you get a one time use item that allows you to order an item or verbie that is completely up to you! You even get the very first of the item on the entire site! "Oh look, it's me, your favorite NPC of all! What...I'm not? Too bad, I am in my book. You see, it's almost my time to shine. My eggs are almost in order and I'm just about ready to ruin help your egg hunting! What? Too soon?" Easter is approaching quickly, and with that there is much on the way! On Sunday, April 14th all the Saint Patrick's Day items in the Main Shops will be retiring and will be replaced with Spring and Easter inspired items! Not too long after that, you can expect the Easter festivities to begin! 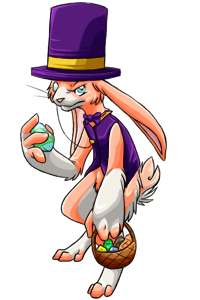 With this in mind, if you have any old Easter Eggs with hidden abilities such as the Troll Egg or the Bichi Egg, then be sure to use them quickly! Once the new Easter Event begins, all old eggs will no longer be usable, and these items will lose the ability to give their respective rewards. We would also like to make an announcement that we will not be accepting custom eggs at this time! We understand that a lot of users look forward to ordering them every year, but we have decided that we will not be accepting them to prevent last minute orders that could impact the event as well as our artists. We would also like to congratulate the winners for this round for the Most Books Read! The Verlympic Event for this round is for the Most Books Read. To win this round, you will have to read as many books to your pets as you can before time for the event runs out. Good Luck! 2 users matched 4 numbers and each won 154,920 VP. A total of 2,168,890 VP was not won this week and will rollover into next weeks jackpot.